A traveling prayer altar helps me stay centered. I love summertime, and am enjoying lots of travel with my husband and children this summer: to the mountains, to the beach, and visiting family. But the same things that make me long for vacation time—getting out of our routine, exploring new places, and spending weeks at a time together as a family—can also, in the moment, be sources of stress. And one routine that I don’t want to get out of is my daily morning time of prayer and meditation. If anything, I need that centering time more when we’re on vacation and off our usual schedules. Also, since it is such a source of peace and clarity for me, why leave it behind when we hit the road? For years I packed my prayer book, intending to pray while on trips, but it never seemed to happen. Perhaps that is because I am a very sensory person, and really enjoy having a physical prayer place set aside in my house as a visual reminder of my prayer practice. My prayer space at home is a simple wooden crate from a craft store placed vertically, with a cloth over the top. My prayer books go in the crate; I place an icon or two, a candle, and some stones or shells on top. I have a meditation cushion that is stored in the crate when not in use. It takes up very little space, but serves as a visual reminder of my prayer time. Eventually I realized that I missed this visual reminder when I was on the road, and set out to take it with me. What I came up with is light, portable, and can be set up anywhere: in a hotel room, in a tent, or wherever you are. The base is a mini cutting board from IKEA. I really do like lighting a candle when I pray, but the electric candle is more practical (and safe!) for travel. A small icon or two and a few stones are included. 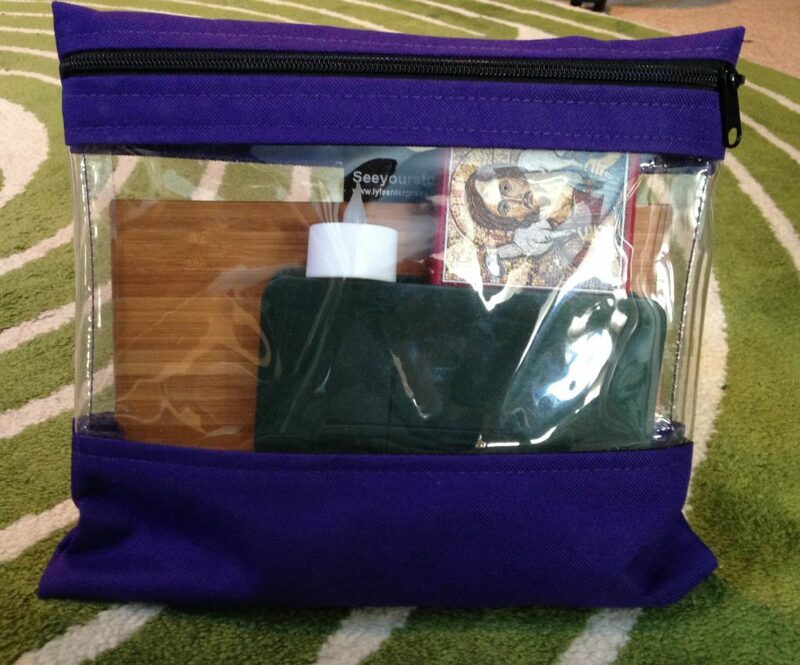 It is all carried in a clear small carrying case from a craft store (the See Your Stuff brand is great). There is room for a prayer book and my Anglican prayer beads in the case. When I arrive at where we are staying, I set up my altar on the dresser and leave it out. I usually move it to the bed and sit there while I pray. I try to keep my time of prayer consistent as at home if that is possible. Close quarters while traveling means that my prayer practice may be more visible to my family than it usually is—and that’s a good thing! This altar could easily be used by the whole family as well. My travel prayer altar has helped keep me more spiritually centered, grounded, patient, and grateful on family vacations and at conferences. Now I don’t leave home without it! What visual reminders help you to pray? What a wonderful meditation and a great way to stay centered on vacation or other trips. I feel centered just reading this reflection!! Thank you so much for sharing this. Prayer while traveling is indeed very difficult – no sense of regularity or stability. This is a truly wonderful idea, something that provides that stability and a place to support the regularity of prayer. Thanks so much for this wonderful idea! Can you share where you got the icon of the Good Shepherd? I’ve not seen that one before. Thank you! The icon of Christ is from legacy icons.com. This is a great idea. Even better for young persons to make a kit during a Sunday School or VBS activity. I am going to introduce it at our fall DoK meeting. 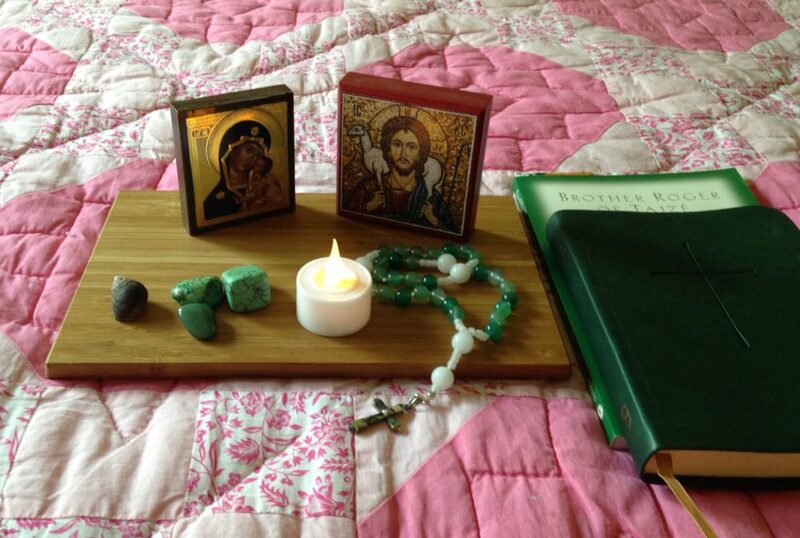 I love the concept of having a traveling prayer altar. As a cradle Episcopalian and artist, I know and understand the significance of icons and the Episcopal Rosary. However, what’s the significance of the stones in the altar? The stones are just because I like them. At home I have a small bowl of colored stones on my prayer altar, the kind you get in a bag at the Grand Canyon or a national park. They represent joy to me. (And so I put them away in Lent!) I chose a few of the green stones to bring because it’s summer, and a shell. Thanks! They are pretty. By the way, I also like the idea of the electric candle. Thank you so much for this terrific idea! Each time I glance at this little mini-altar I am reminded to pause for a moment, take a deep breath and go within for just a few seconds. These tiny breaks bring me back to my center and restore my conscious awareness to a higher perspective in an instant.